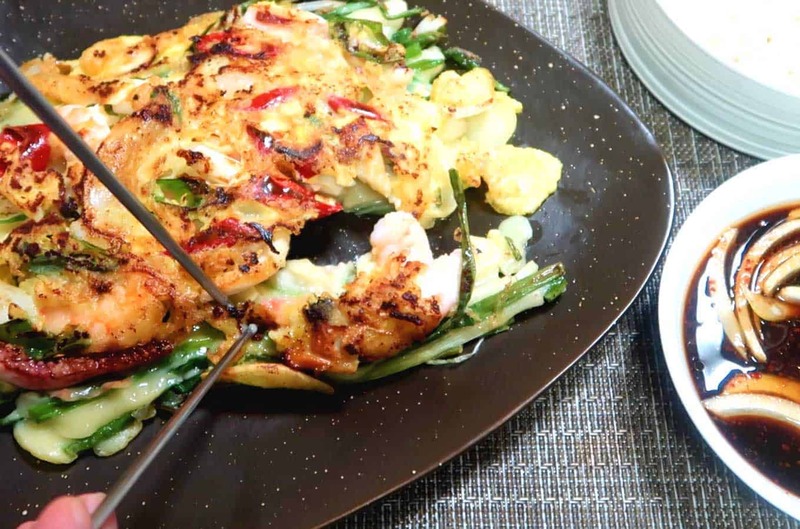 Korean Seafood Pancake (pronounced Haemul Pajeon) is one of the most popular types of pancakes in Korea. In most countries, pancakes refer to a sweet breakfast dish – filled with fruit and topped with syrup. In the West, pancakes refer to a sweet breakfast dish – topped off with fruit and maple syrup. But in Korea, pancakes refer to something else. It is battered, but not sweet or eaten during breakfast. 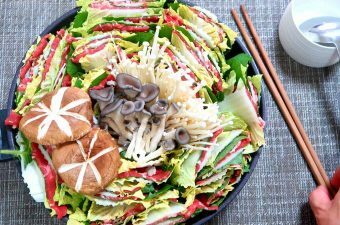 Instead, it is mixed with fresh vegetables and meat – and served as a banchan or mini-meal during special holidays. Strangely, Koreans also really like to eat pancakes during the monsoon season in Korea (late June – July). Not sure why that it is – but chances are if it is raining outside, Koreans will suggest to get some pancakes for dinner. Katie has one theory for why that is: When you cook Korean pancakes, you will hear the batter sizzling in the oil. That sizzling sounds similar to the sound of rain hitting the ground. So when you hear rain, you think of pancakes 藍. Not sure if I believe it 100%, but sounds good enough for me! 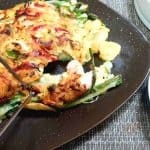 Korean Seafood Pancake is one of my favorite types of Korean pancakes. 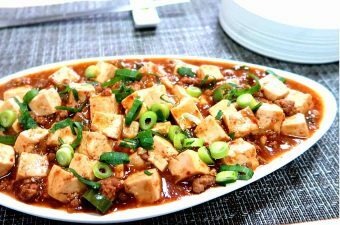 It typically has shrimp and squid as the main ingredient (some areas like to add mussels or clams too) and a thin layer of green onions. I have eaten these pancakes at specialty shops throughout Korea. And the best shops focus on minimizing the amount of batter in each pancake. Less batter = More taste from the fresh ingredients. The best shops do not dunk all of the ingredients into the batter. But instead, add batter to the pancakes as they cook. We will try this method today – so that you can taste the full flavor of each ingredient. Note: This recipe makes two large pancakes. Each pancake is enough for two people. So this recipe is good for 4 people. A key taste variable for this recipe is Korean pancake mix. Korean pancake mix is made primarily of flour – with some potato starch, salt, baking powder, sugar, and garlic powder. You can find it at any Korean mart or Amazon. When it is raining outside - nothing better than Korean Seafood Pancake. 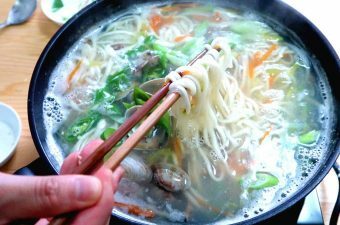 Throw in a bottle of makgeolli and your dinner is set. Wash green onions thoroughly. Chop them in half. Place them on a plate. Grab half of the stems and turn them upside-down. Now the stems and stalks are mixed evenly. Cut onion into thin slices. Slice green and red pepper at a slight angle. 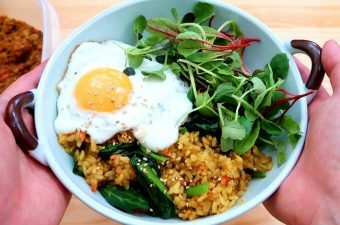 Crack one egg in a bowl and mix it thoroughly. 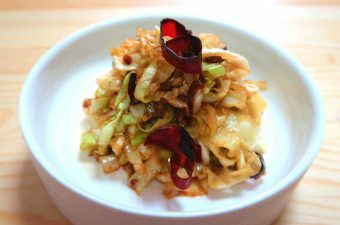 Clean squid and chop into small bite-sized pieces. Take out a large mixing bowl. Place in Korean pancake mix and water. Mix together thoroughly, so that there are no lumps. Take out a smaller bowl and make dipping sauce by mixing soy sauce, vinegar, sesame oil, and Korean red chili flakes together. Add a few sliced onions into the dipping sauce. Take out mixing bowl. Grab half of the green onions from your pile. (Save the other half for the second pancake). Then take out a dining spoon. Use 5 spoonfuls of batter to coat the green onion stalks. Use your hands to get it coated well. Put a frying pan on medium heat. Pour some oil in and get the pan evenly coated. Once pan is hot, place the green onions in. Gently place the green onions around in the pan to create a bed. Let it cook for 1 minute. Finally, use a spoon to put half of the egg mixture on top. This will help bind it all together. After you place the egg mixture over the top, carefully flip the pancake with a spatula. (It's okay if it breaks on the flip - always tough on the first try!). Reduce the heat to a low - don't forget! Let the pancake cook on low for 3 minutes. After 3 minutes, grab a plate and flip it back over to its top-side. Eat it with the dipping sauce. Use your best non-sticky frying pan. Add some more oil after you flip the pancake for the first time. This will keep it from sticking on the second flip.